You can find Tiler Peck just about anywhere these days—onstage at New York City Ballet, in commercials, on "The Ellen Degeneres Show." And let's not forget starring in 2014's Little Dancer, a musical that followed the creation of Edgar Degas' famous sculpture, "Little Dancer Aged 14." Peck played Marie van Goethem, the young Paris Opéra Ballet School student who modeled for Degas. Now, she's reprising the role—er, her likeness is—for a good cause. Visual artist Elliott Arkin has created a series of limited edition sculptures of Peck as the Little Dancer. Proceeds will go to Dance Against Cancer, the annual benefit concert for the American Cancer Society produced by NYCB principal Daniel Ulbricht and Manhattan Youth Ballet programming director Erin Fogarty (both of whom lost a parent to the disease). Peck will also be part of the event's star-studded cast; all of the dancers donate their time, and most perform in memory of a loved one. Houston Ballet's Jared Matthews and Sara Webb in"The Sleeping Beauty." Photo by Amitava Sarkar, Courtesy Houston Ballet. Despite the devastation and pain that Hurricanes Harvey and Irma have left in their wake this fall, it's been encouraging to see dancers step up in aid of their communities: When the future of Houston Ballet's Nutcracker seemed uncertain, venues around the city pulled together to allow the company to produce the show on a "hometown tour." And when Florida ballet companies had to evacuate, Atlanta Ballet and Charlotte Ballet welcomed them with open arms. In addition, New York City-based studio Broadway Dance Center offered community classes in September with proceeds donated to the American Red Cross. The next in this series of good deeds is Hearts for Houston, a benefit performance bringing dancers from seven major companies together at New York City's Alvin Ailey Citigroup Theater to raise money for the United Way of Greater Houston's Harvey Relief Fund. 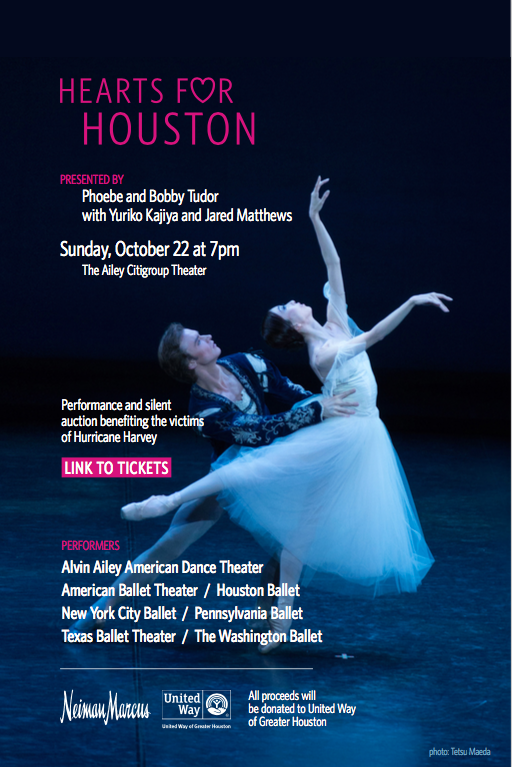 Scheduled for Sunday, October 22, the evening will feature members of the Houston Ballet, American Ballet Theatre, New York City Ballet, Pennsylvania Ballet, Texas Ballet Theater, The Washington Ballet and Alvin Ailey American Dance Theater. Hearts for Houston is imagined and produced by Houston Ballet principal dancers Yuriko Kajiya and Jared Matthews (both formerly of ABT) and funded by patrons Phoebe and Bobby Tudor and sponsor Neiman Marcus. Ulbricht's company, Stars of American ballet, heads to Jacob's Pillow on July 29. Photo by Paul Kolnik, Courtesy NYCB. Admirers of New York City Ballet principal Daniel Ulbricht probably consider "puckish" an ideal adjective for his personality and his dancing, thanks to his definitive performance as Puck in Balanchine's A Midsummer Night's Dream. They would be surprised to learn that someone so convincing as Shakespeare's scampish prankster would soberly discuss dancing not only as a responsibility, but as a mission. From his Stars of American Ballet touring company to his Dance Against Cancer event, Ulbricht uses every ounce of his spare time uniting ballet with good causes. Whoever thinks dancing is a selfish profession hasn't met New York City Ballet principal Daniel Ulbricht. Once again, he’s joining forces with the American Cancer Society for his annual Dance Against Cancer benefit on April 27 in New York City. Ulbricht, whose mother is currently battling uterine cancer, and his co-producer Erin Fogarty, who lost her father to colon cancer, conceived of the event in 2010, bringing stars from the ballet, modern and Broadway worlds together for a dance-packed evening—with all proceeds going to the American Cancer Society. Since then, they’ve raised $325,000—and that doesn’t include this year’s total! What’s even better is that the dancers volunteer their (very valuable) time. 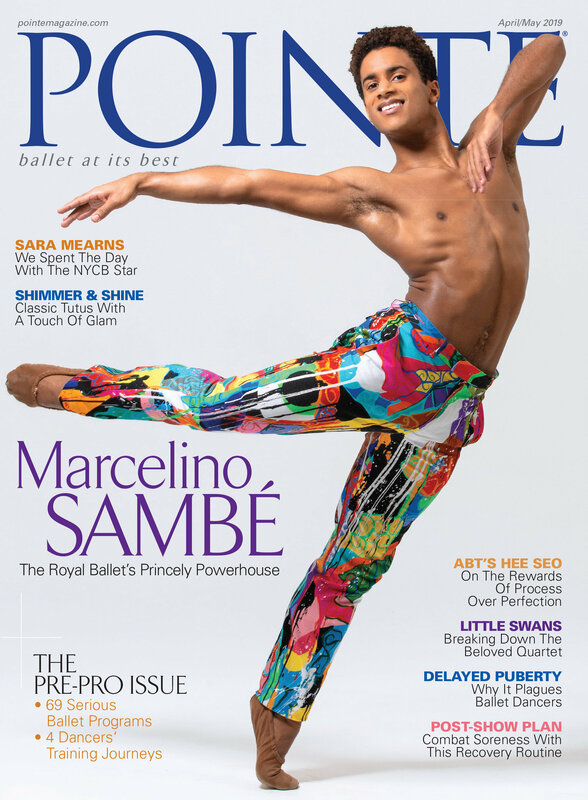 This year’s roster includes NYCB’s Maria Kowroski, Sara Mearns, Tiler Peck, Robert Fairchild and Amar Ramasar; American Ballet Theatre’s Stella Abrera, Gillian Murphy, Herman Cornejo and Marcelo Gomes; Boston Ballet’s Jeffrey Cirio, Alvin Ailey’s Matthew Rushing; Desmond Richardson; Sasha Radetsky and many more. These dancers' hearts are just as big as their talent. For tickets and donation information, click here. On Monday night, "Dance Against Cancer" raised over $25,000 for the American Cancer Society. The event, held at Manhattan Movement & Arts Center, was co-produced by Daniel Ulbricht, whose mother is currently battling uterine cancer. It featured several of Ulbricht’s fellow New York City Ballet dancers, along with "So You Think You Can Dance" star Alex Wong and members of Keigwin + Company, Lar Lubovich Dance Company and more. The evening was driven by a strong sense of purpose: We learned during an introductory film that each participant had been touched by cancer in some way. The performance starts at 7 pm at Manhattan Movement and Arts Center. Click here for tickets. All proceeds go to the research initiatives and the patient and family services programs that American Cancer Society funds. As if Daniel Ulbricht didn’t already have enough on his plate. In addition to dazzling audiences at New York City Ballet and serving as artistic advisor for Manhattan Youth Ballet, he’s co-producing Dance Against Cancer: An Evening to Benefit the American Cancer Society. Held tonight at the AXA Equitable Theater in NYC, the event features an all-star line-up that includes leading artists from NYCB, American Ballet Theatre, Boston Ballet, Miami City Ballet, Alvin Ailey American Dance Theater and the Paul Taylor Dance Company, as well as Charles “Lil Buck” Riley and Clifton Brown. Alessandra Ferri is also making an appearance, dancing the central pas de deux from Christopher Wheeldon's After the Rain with NYCB’s Craig Hall. All proceeds go towards the American Cancer Society. Ulbricht, whose mother is currently battling uterine cancer, started the gala event along with co-producer Erin Fogarty four years ago. Since then, Dance Against Cancer has raised over $100,000 for the organization. Interested in showing your support? Click here to donate. DAC 2014 Trailer from Dan Bittner on Vimeo.